Shinshinto: Jyo Saku: Settsu province. Blade length :　50.6　cm or 19.92 inches. Sori :0.8 cm or 0.31 inches. Width at the hamachi : 2.87 cm or 1.12 inches. 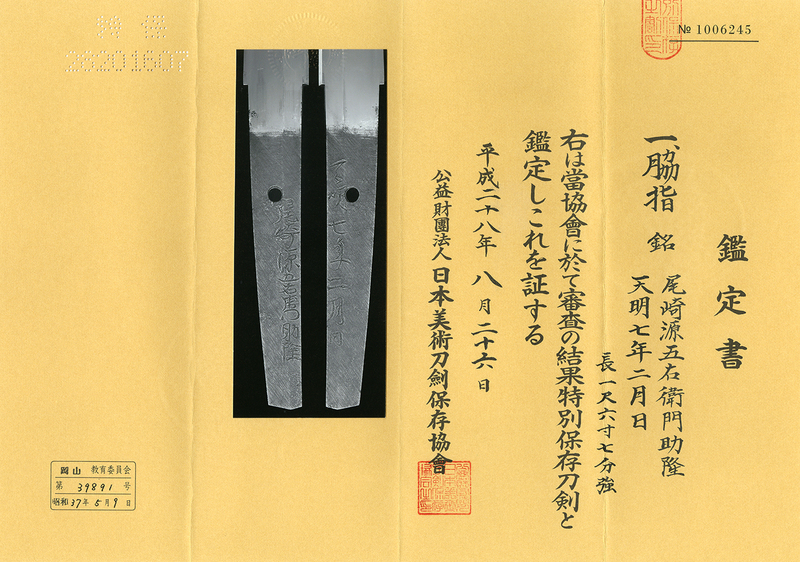 Width at the Kissaki : 2.32 cm or inches. Kasane : 0.63 cm or 0.91 inches. Era : Edo period. Tenmei 7 nen(1787). Shape : Regular width and thickness, nice shape Wakizashi. Hamon : Nie Deki, Doranba with thick Nioikuchi. in Harima province. He moved to Osaka and studied under Kuroda Takanobu. He passed away in 1805 at age of 53. He was deeply infuluenced by Tsuda Echizen Kami Sukehiro. He was energetic about making the Doranba Hamon. as the first sword smith of Shinto. Consequently, Suketaka and other sword smith(Sushinshi Masahide, Ichige Tokurin, Taikei Naotane, Tegarayama Masashige, Chounsai Tsunatoshi etc…) tried to make Doranba Hamon. Among them, Suketaka can made constant Doranba. Tsuba : Round shape iron Tsuba, crane is engraved with open work. Menuki : Shakudo, chrysanthemum is engarevd with gold color. Fuchikashira: Shakudo, chrysanthemum is engarevd with gold color. From Aoi Art: During Shinshinto era, a large number of sword smith which made Doranba Hamon. This Jigane is Osaka Jigane and masterpiece. The blade remind of Tsuda Echizen Kami Sukehiro. Especially this Soshu-den with thick Nioikuchi looks like old Shizu blade. This Koshirae is also nice.